Homo Deus (2015) explains how we came to be the planet’s dominant species and uncovers a prediction for the future of humanity. It examines our present humanist state, the notion of individual choice and how we persist in worshipping the individual. It also reveals how science and technology will eventually make humans subservient to computer algorithms. What heights we scale! Humanity’s ambitions change by the day. For humankind, progress and innovation is nothing new. We have strived for the stars and reached the moon. We have developed the means to defeat famine, disease and the effects of war. But as we advance, our ambitions must be modified. Let’s consider how far we’ve come. We can now check the spread of famine and disease – catastrophes that killed many in the past. In France between 1692 and 1694, for example, famine killed 15 percent of the population (that’s about 2.5 million people). The infamous Black Death pandemic killed between 75 and 200 million in Eurasia in the 1330s. That’s about a quarter of its entire population. But nowadays we have mostly overcome famine and disease. In fact, you’re more likely to die from obesity than hunger. In 2010, 3 million died worldwide from obesity. Conversely, malnutrition and famine combined killed only a third of that total. We’re so advanced that we measure our catastrophes on a different scale. Take the Ebola crisis. Although it’s considered a serious modern epidemic, it killed “only” 11,000 people. It’s much the same with war. It’s an exceptional occurrence rather than a given. You're more likely to die from diabetes (1.5 million deaths in 2012) than war (120,000 in 2012). Does this matter? Well, it means that as a species humankind can adjust its goals. We can aim to live longer or become happier and stronger. We’re on the way. Twentieth century medicine has almost doubled our life expectancy. Some people even think immortality is possible. We also feel like we can live more happily. That’s why, according to a 2013 Survey on Drug Use and Health, over 17 million Americans reported using ecstasy. Technology is also used to strengthen our bodies. Now paralyzed patients control bionic limbs through thought alone. But it's just the start. We can strive higher yet. Humans claimed superiority over animals and proved it through collective cooperation. Religion has given us narratives and these encapsulate moral dilemmas. Modernity means we can shape our lives. But has meaning been lost? Liberal societies derive meaning from human experience, not God. Modern science threatens liberalism at its heart. Algorithms and technologies will one day rule our lives. As algorithms get ever more powerful, we face a choice. Fight back or let them prevail? 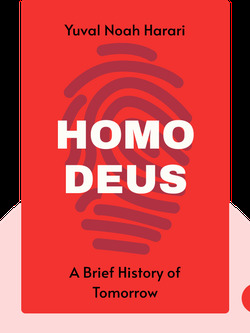 Start your free Blinkist trial to get unlimited access to key ideas from Homo Deus and over 3,000 other nonfiction titles. With bitesize text and audio, it's easier than ever to find the right ideas to transform your life.